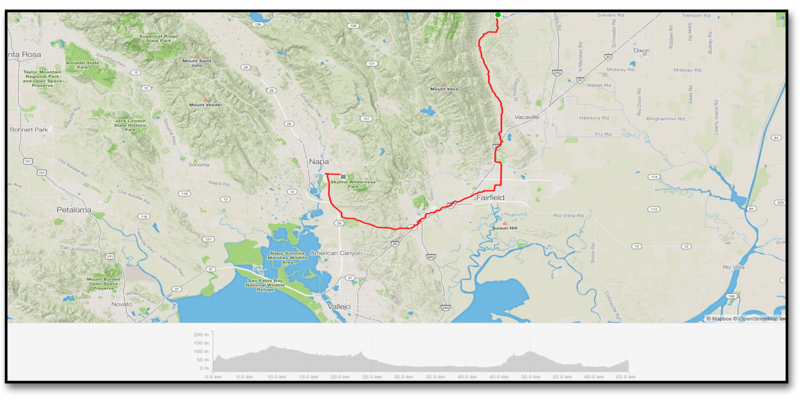 Day Thirty, Solano River to Napa, California. Got up real early so we could start at 6:30 and try to beat the heat. Rode to Faifield in the rising sun through the beautiful valleys around Fairfield and kept a watchful eye on the thermometer as it climbed into the mid 30’s. After a brief stop in Fairfield for lunch we pushed on to the car-loving capital of Napa on the scary highway 12. Picture a bike lane on the side of the 401 and that is the only route to Napa. Napa is actually not my favourite town out of all the places we have visited so far as it is very car-centric and not that exciting a place really. The surrounding countryside is ok, but the town itself is a bit dull. We stayed at the Skyline campsite on the edge of town and that was handy as tomorrow we are going to make a push for the coast and hope to land at Samuel Taylor State Park on the coast and the first stop in our coastal bike tour. the heat is still a real problem however, and it has messed up our plans as it is very hard to ride in such conditions. On the road again. Sunrise over Napa. The only way into Napa from Solano – Nothing like semi’s whipping past you at 80mph!. Setting up at Skyline Campground in Napa. Dinner in Napa at the brewpub.